While I was offered compensation for trying out Sands Alive! all opinions here are mine. 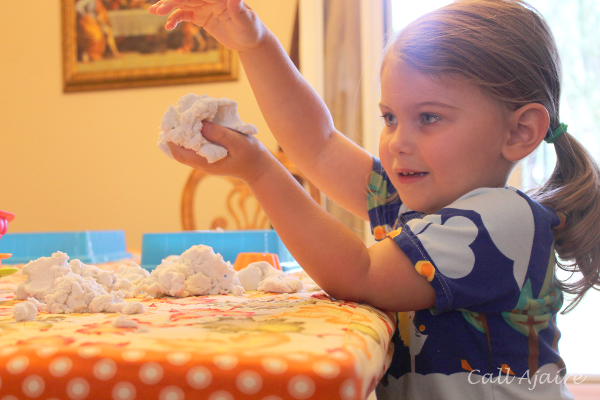 Spoiler Alert: I really am this crazy about messy activities, hehe. If you follow me on Instagram, you may have seen me use #sometimesimafunmom, but for the most part I feel like things can get pretty bland around our house. Bean and I get into a routine of reading, puzzles, listening to music, and the occasional lego/train adventure, mostly because we enjoy it, but also because I’m not a big fan of making a mess. 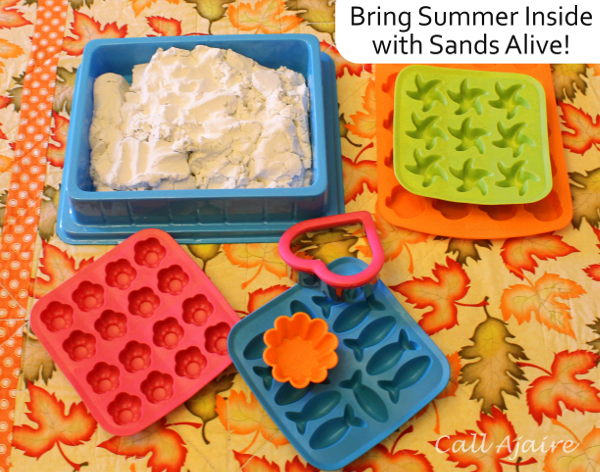 So when JoAnn Fabrics & Craft Stores contacted me about sharing how we’d use the Sands Alive! play sand they carry I decided to go for it as a change of pace, though to be honest I was worried it’d be an afternoon full of mess making, hehe. I couldn’t have been happier when we opened the bag of Sands Alive! to find it wasn’t messy AT ALL. It sort of feels like sand, but it holds a shape without being moist. 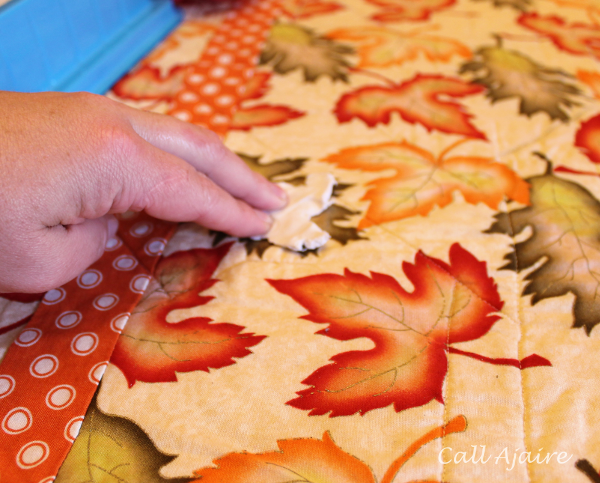 As you pull it apart, any little pieces that break off just pick right back up without leaving any residue. Okay, enough about my obsession with how little clean-up an activity requires. Let’s talk about how FUN this stuff is! Bean was beside herself excited. 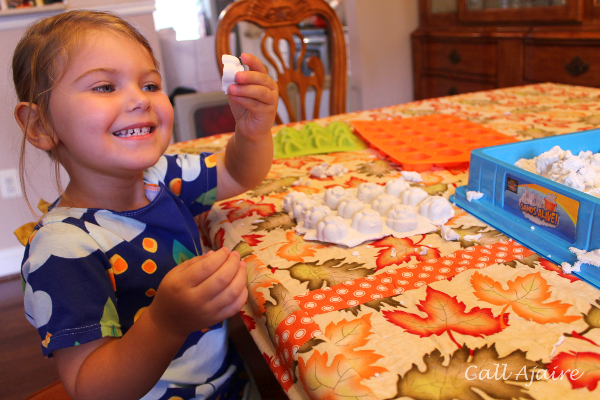 We got out the silicone molds and she really enjoyed filling them and making the shapes. 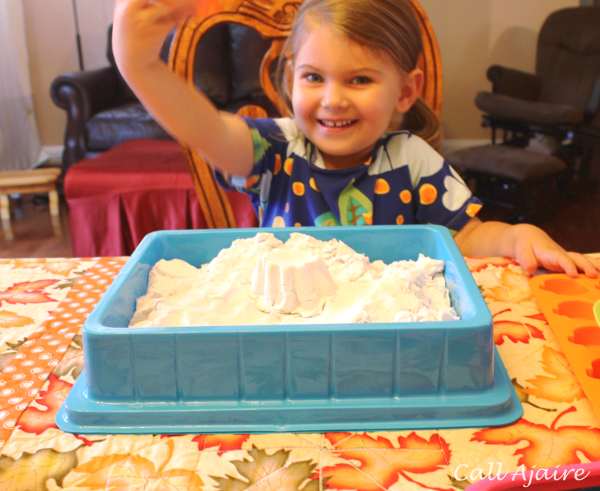 We didn’t get the chance to make any sand castles this summer and she’s been talking about it lately, so inside on this rainy day in September, Sands Alive! was the perfect way to extend our summer. Originally I was going to use the Sands Alive! 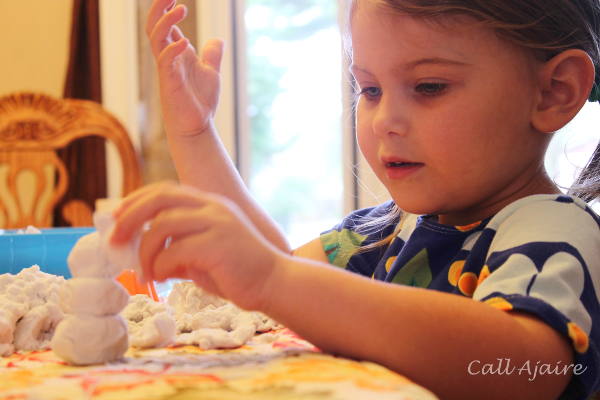 for a craft, but when I started thinking about how we don’t often do this type of activity, I decided to make it all about Bean being able to play. At one point she said it was kind of like snow, so we made a snowman. Now humor me while I get back to how easy this stuff is to clean up. We are a no-play-dough house at this point, mainly because we’ve seen other people’s carpet stains and I’m not thrilled about the idea of trying to get dried play dough out of the rug. But not only does Sands Alive! not dry out, but it doesn’t stick to the carpet (or the table quilt above) so there’s no need to worry. And I tested it too, hehe. I really rubbed this piece in good and it came right off without even leaving some sandy bits behind. 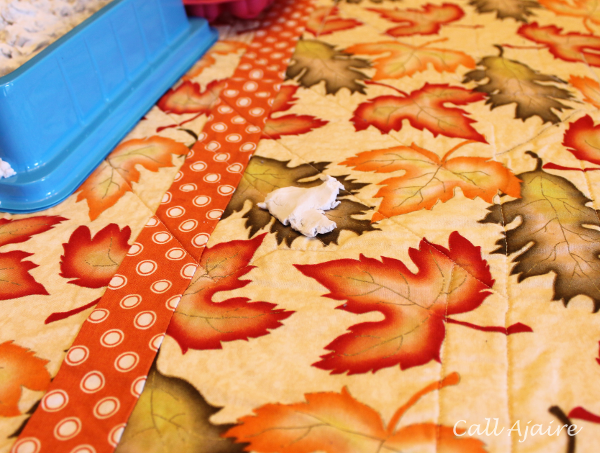 The rug under the table also got some pieces smooshed in (by Bean of course), but they sort of cling to each other as you sweep them up and whats left over comes right out with the vacuum so the clean up afterward was stress free. So if you’re looking for something fun to do as the seasons change and you’re spending more time indoors, I can definitely recommend Sands Alive!. And if playing isn’t your thing, then I’m sure you’ll take interest in one of the fun craft projects JoAnn Fabrics’ creative team came up with.